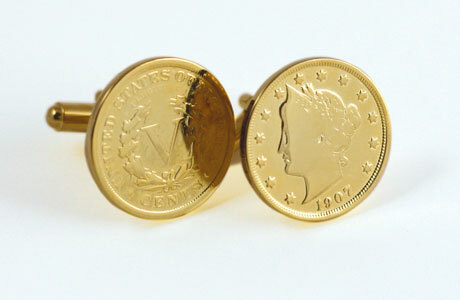 Show your French cuffs in style with our 24k Gold-Layered Liberty Nickel cufflinks. Exquisite cufflinks with genuine Liberty Nickels minted 1883-1912. The Liberty Nickel is sometimes referred to as the "V" nickel. It features Lady Liberty wearing a wreath and coronet on the front and a "V" surrounded by a wreath on the back. Includes a Certificate of Authenticity. Allow 1-2 weeks for delivery. Item can only be shipped within the Continental US.